Despite all the images of Hurricane Sandy that have pervaded the media outlets worldwide this week, Philadelphia painters/sculptors seem to be still arching forward and unstoppable. Honoring the Pennsylvania Academy of the Fine Arts: Faculty and Alumni opened to a near capacity-filled Artists’ House Gallery preview in downtown Old City last evening. This exhibit has nine faculty members of the Academy (a.k.a. PAFA) exhibit their own work while selecting a small group of alumni to showcase a widely eclectic group exhibit of oil painting, acrylics, printmaking, sculpture and mixed media – twenty-six different alums with a unique voice as to their interpretations of their respective mediums. Patricia Barrera: “Hidden Memories”. 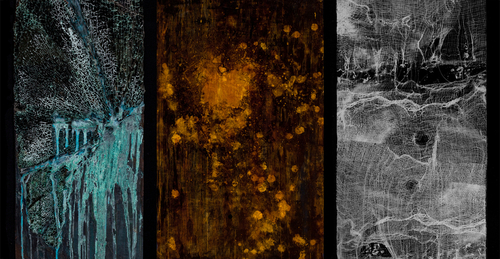 Triptych, mixed media, 36″ x 44″ overall, 2010. Mixed-media artist and Academy alum Patricia Barrera utilizes materials as diverse as paint, broken glass and gauze on canvas to weave a narrative story that appears to be memories that the artist uses through sublimation of others’ negative experiences. Her artist statement reflects on how her work employs materials/objects that personally recollect for Barrera the escalating volatility of present-day Mexico. One can easily see how Barrera aptly uses what appears to be patination “tactics” that appear as though one piece of this “trilogy” contains rusted steel that is decorated on the surface with a grimy orange rust, like a patinated artifact found on an urban street intersection. The left side of the triptych depicts broken shards of what could be auto-glass shattered with painterly drizzles of blue-ish green paint cascading down in a realistic “glass-smashing” scene. While all of this sounds disturbing, seeing this piece in-person actually does create a sense of disruptive beauty, or an urban-decay excitement to the viewer. Mike East, “Looking West”. 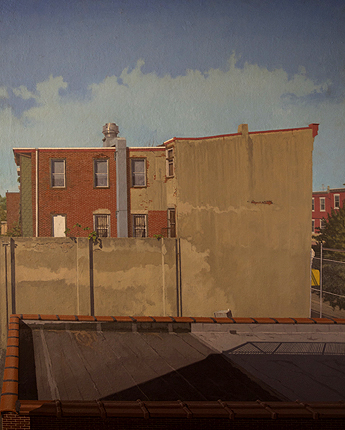 Oil painting, 48″ x 72″, 2011.
the “urbanscape” of the quintessentially “Philly” neighborhood locally known as the Art Museum area, in this case, surrounding 27th and Girard Streets. The photo-like realism of East’s roof-top details, such as ornamental bars on windows, chain-link fences on the far right and parallel-running of red brick cylindrical shapes across the canvas’ middle contrasts with the beige rectangular flat painted areas of the building facades. East cleverly uses the typically-Philadelphia Victorian architecture of the flat roof to create a play of shadow that reflects downward and leads the viewer to wonder just where exactly is this artist standing while he creates this particular work. The mystery of his viewpoint is as fascinating as the details within the piece itself. Elizabeth Osborne: “Red Wave”. 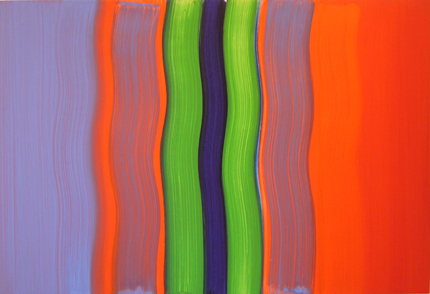 Oil painting on birch panel, 30″ x 44″, 2012. One cannot possibly discuss a show of this extent without mentioning the impressive works appearing by venerable Academy faculty such as Elizabeth Osborne (faculty member of the Academy since 1963) along with Bruce Samuelson, Al Gury, Renee Foulks and Dan Miller. The deliberately broad brushstroke Osborne uses in her paintings is not only an emblem of the extensive array of abstract paintings in the artist’s catalogue of works – but a testament to her confident use of rhythmic brushstrokes and line despite intentionally employing a limited palette. Thirty-five artists total are exhibiting this month at Artists’ House, October 31st through December 2nd, located at 57 N. 2nd Street in downtown Philadelphia, PA. I love your blog because (a) yes it does and (b) i get to see and feel things I wouldn’t be otherwise exposed to in my little corner of the world. Thank you, gentlestitches. I’m equally enjoying your blog and love to see your latest creations! I envy the vibrant artistic community you live in – or maybe we have the same here, but the appeal is in the difference? Anyway, a good post. Our news tells us that the worst of Sandy is over for you, thank goodness, but the clear-up must be a trial. Thank you, Pete, for your always inspiring comments – your visits to my blog are always welcomed! I do tend to agree that the “grass is always greener” as I see potters and ceramic artists in the U.K. (using clay medium as an example) constantly developing stunning work. Many of us here have been deeply inconvenienced by the hurricane – but I’m astounded as to the speed which many have cleaned up the messes and gotten right back into their daily lives (such as this exhibit going right as scheduled.) Thanks again for stopping by and commenting! Three very different works – great to see. In the circumstances, it surely shows that art does matter! Thanks for this post and best wishes for the work ahead. Thanks for your positive feedback, Philippa! As always, I’m really enjoying your blog and look forward to seeing more of your lovely paintings. Thank you, stitchedupmama. I can assure you this JPEG doesn’t nearly do justice to the intensity of the triptych. Always glad to hear your feedback and welcome your visits anytime!